With clouds and land forming a backdrop, the SpaceX Dragon commercial cargo craft is grappled by the Canadarm2 robotic arm at the International Space Station. This space wallpaper reveals, with clouds and land forming a backdrop, the SpaceX Dragon commercial cargo craft is grappled by the Canadarm2 robotic arm at the International Space Station. 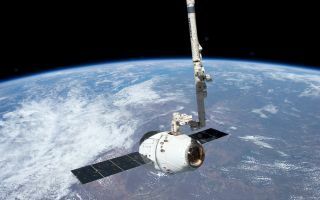 Expedition 31 Flight Engineers Don Pettit and Andre Kuipers grappled Dragon at 9:56 a.m. (EDT) and used the robotic arm to berth Dragon to the Earth-facing side of the station's Harmony node at 12:02 p.m.